Bet you didn't see that one coming, did you? After months of waiting, Thor: Ragnarok was finally released on Digital HD this morning and with it, a slew of special features. One of these features, which are included when you buy the film on Vudu or iTunes, shows 14 minutes of scenes deleted from the theatrical cut of the movie. 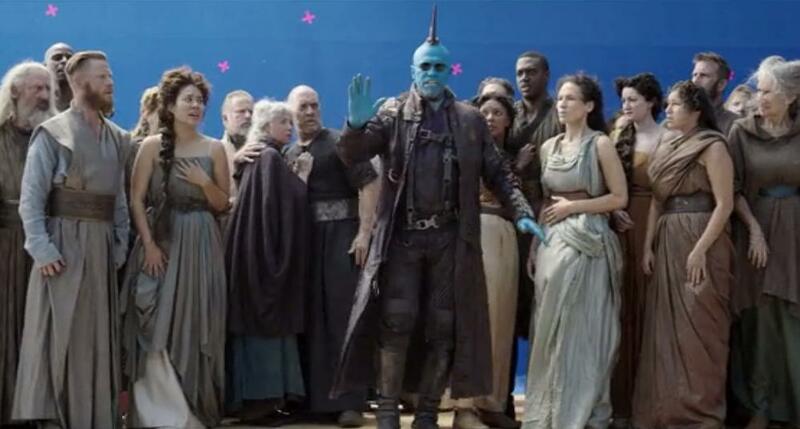 In this sequence, the final scene includes a Guardians of the Galaxy cameo that no one was expecting: Yondu, played by Michael Rooker. The scene in question comes in the middle of a public execution on Asgard. Skurge (Karl Urban) is about to kill an Asgardian woman for opposing Hela (Cate Blanchett), when all of a sudden someone from the crowd yells for him to stop. In front of a blue screen, Yondu pushes through the crowd, wearing his sunglasses and Ravager jacket. He stops the execution to ask where Kevin and Lou's offices are. Once he's pointed in the right direction, he tells Skurge to proceed with what he's doing, and the extras standing behind him begin to laugh. You may be asking yourself, "How would this have made sense if it was in the movie? Didn't Yondu die in Guardians of the Galaxy Vol. 2?" Yes, you are correct. Unfortunately, this "deleted scene" seems to have only been filmed for the extras on the home release. The first major clue to this is realizing that Yondu isn't actually at the same location as Cate Blanchett and Karl Urban. Instead, the camera just turns to make him look like he's there and that the scene isn't finished yet, but it was just shot to seem like he's interacting with those characters. The other big giveaway here is the "Kevin and Lou" line that Yondu delivers. As you can probably guess, Yondu isn't referring to any real characters in the movie, but to Marvel producers Kevin Feige and Louis D'Esposito. This meta-Marvel joke affirms that the scene was more of a gag specifically made for these special features. Just think about how great it would've been to have Yondu in the actual movie, though. His oddball sense of humor would've been a great fit for Taika Waititi's unique style of comedy, and now we're all just wishing this was a real thing. Thor: Ragnarok is now available for purchase digitally, and the Blu-ray will be released on March 6.